When it is time to get out of the house and take a trip if you have a child that requires a little equipment. Fortunately, many companies have taken that into consideration and have tried to “lighten the load” a little by coming up with some lightweight options for travel strollers. There are several options when it comes to travel strollers these days. Most are lightweight options and several have features that you would find in your larger everyday models. The main thing about travel strollers is that they are scaled down versions of your everyday models but they still focus on safety, comfort, and function. The main concerns are how they fold and carry and how easy they are to transport. We are going to look at some of the top models on the market today. There are basically only three main types of lightweight travel strollers. Let’s take a look at them. A convenience stroller usually a travel stroller that is lightweight with extra features than a regular umbrella stroller. However, these strollers are a little bit heavier and bulkier. 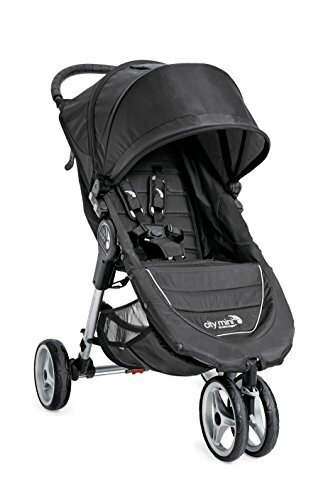 Some of the extra features you can find on these strollers are storage areas, reclining positions, bigger canopies, cup holders, snack trays, and more. However, these strollers are still small and compact. Check out some of the best lightweight strollers here. Umbrella strollers are common strollers for travel. They are lightweight and compact. They’re also inexpensive but functional. The downside is though that many offer very few features that other strollers have. Check out the best umbrella strollers here. Lightweight – When traveling, you find yourself toting the stroller quite often so if the stroller can be as light as possible, the better off you will be. Harness – You want to keep your child safe. Look for a five-point safety harness. Many umbrella models only have three-point safety harnesses and these are not as safe. Reclining Option – Your child will be more comfortable if they do not have to sit straight up. It also makes it easier to nap if the seat reclines. Some seats also have the option to lie flat which is great for infants and also for changing children on the fly. Canopy – A canopy can keep your child out of the elements and out of the sun’s harmful rays. Some canopies extend or are adjustable for further coverage. There are even some that have a peeking window so you can look in on the little one without disturbing them. Air Vents – Air vents that zip open for circulation in hot weather are a nice option if you know that you will be spending time in the heat. Easy to Fold – Fighting to fold and unfold your stroller is no fun. Add in trying to do that at an airport or when you are in a hurry at the train depot and the stroller will do you no good. Look for strollers that are easy to fold – preferably with one hand – and auto lock. Some will even stand on their own. Storage – When you are touring the Wild Kingdom a storage area for a diaper bag and souvenirs comes in handy. Some strollers even come with smaller handy pockets for smaller items such as keys and phones. Carrying Accessories – You need a hand to help carry that travel stroller. That is why it is great if the stroller comes with an attached carrying strap or a carrying bag. A bag also helps protect the stroller if you have to check the stroller in when you board a plane. Handlebar – Not everyone is the same height. That is why the best handles are height adjustable or telescoping for the comfort of those that push the stroller. It also makes the handles more ergonomic. Locks and Brakes – Some strollers come with handle brakes or wheel brakes. These are great features to have to stop the stroller from moving. Snack Bar – Whether it is at the height of your child or at the parent’s height, you want a cup holder. Your child is always going to want a cup or bottle and you want to have it close at hand. If you are looking for a simple lightweight stroller that is great for travel, you may want to consider the Baby Trend Rocket Lightweight Stroller. This stroller weighs only 12.5 pounds. The handle on this stroller is comfortable and ribbed to make steering easier. The parking brake is activated by dual foot. Parents will love the organizer tray, the two cup holders, and the small pocket to keep incidentals. The storage basket under the stroller is great for stowing your diaper bag. The detachable canopy is good for keeping your child out of the elements and protect them from the sun’s rays. For comfort, the seat reclines into multiple positions. For safety, there is a five-point harness. This stroller will accommodate children up to fifty pounds. The Baby Trend folds compactly for storage and travel. This affordable stroller comes in two colors. This stroller weighs only 12.5 pounds. Parents will love the organizer tray, the two cup holders, and the small pocket to keep incidentals. This affordable stroller comes in two colors. The stroller is very short and average to tall people have to stoop over. Steering is difficult as the wheels are not easy to maneuver. The reclining option is adjustable by a string and not easy to adjust. The Baby Trend Rocket Lightweight Stroller has some good and not so good things about it. This stroller weighs only 12.5 pounds. Parents will love the organizer tray, the two cup holders, and the small pocket to keep incidentals. This affordable stroller comes in two colors. The detachable canopy is good for keeping your child out of the elements and protect them from the sun’s rays. There is a five-point harness. This stroller will accommodate children up to fifty pounds. However, the stroller is very short and average to tall people have to stoop over. Steering is difficult as the wheels are not easy to maneuver. The reclining option is adjustable by a string and not easy to adjust. There is not much shade provided by the small canopy. And the seating area is on the small side so it may be a squeeze for toddlers. You may want to save your money up and buy a travel stroller that has more options and will suit your needs more. When traveling, you are probably looking for something lightweight. If this is the case, you need to take a look at the Chicco C6 Stroller. This aluminum framed stroller only weighs eleven pounds. The canopy is very round, is adjustable for the right spot and is removable when it is not needed. To carry your extra needed items, this stroller has a storage area. With an all-wheel suspension, the front wheels swivel and lock. To make travel easier, this stroller comes with a carrying bag and a carrying strap. This makes transporting the stroller easier. For safety and comfort, not only does the seat has multiple reclining positions, but a five-point safety harness. You can spot clean the fabrics if they get dirty to keep your stroller neat. This affordable stroller comes in two fashionable colors. The stroller folds quickly and easily for travel. The carrying strap is attached to the stroller for ease of travel. The stroller is lightweight at only eleven pounds. The handlebars are not adjustable so average to tall parents may have to stoop over. You may easily kick the wheel as you walk and you could accidentally push the brake. Maneuverability is not the easiest and requires two hands. The Chicco C6 Stroller is not the best in travel strollers but it does offer some of the things that you are looking for in a travel stroller. The stroller folds quickly and easily for travel. The canopy is removable. The carrying strap is attached to the stroller for ease of travel. The stroller is lightweight at only eleven pounds. However, the Chicco has many issues. The handlebars are not adjustable so average to tall parents may have to stoop over. You may easily kick the wheel as you walk and you could accidentally push the brake. Maneuverability is not the easiest and requires two hands. For best results, you need to shop around for a travel stroller that offers maneuverability, is lightweight, and offers the features that you are looking for in a stroller. If you are looking for a quality stroller that won’t let you down while you are traveling, then look at the UPPAbaby G-LUXE Stroller. This aluminum framed stroller weighs in at fourteen pounds. The UPPAbaby has a height adjustable canopy that protects your child from harmful UVA and UVB rays. It is made from water and stain resistant fabric and is removable. The extendable shade is SPF 50 plus. You can easily remove the seat pad and fabrics from the stroller and machine wash them. You can still use the stroller while the stroller seat pad is being cleaned. In a fully reclined position, this stroller will accommodate a three-month child and is suitable in other positions for children up to fifty-five pounds. The seat recline with just one hand. The seat also has a footrest that is adjustable. The G-LUXE folds easily and your feet are not required for assistance. When the stroller is folded, it will stand by itself. There is a carrying strap that makes it easy for traveling. For the parent’s comfort and convenience, this stroller has ergonomic handles that suit parents of any height and a cup holder. The wheels of this stroller are a massive 5.75” and you can stop the stroller with just one step of the brakes. This stroller is made of high-quality materials. The seat of the stroller is easy to adjust. The brakes stop with just one simple touch. The canopy is adjustable, SPF 50 plus, and removable. There is not a peek window in the canopy – but it is removable. It may be hard to push the stroller on uneven terrain. The stroller is more costly than some other travel models. The UPPAbaby G-LUXE Stroller is a great option for a travel stroller. It has many things – and more – that you may be looking for in a travel stroller. This stroller is made of high-quality materials. The seat of the stroller is easy to adjust. The brakes stop with just one simple touch. The canopy is adjustable, SPF 50 plus, and removable. The handlebars are made so that they work for parents of any height. The stroller will accommodate a child up to fifty-five pounds. The stroller only weighs fourteen pounds. There are a few drawbacks. There is not a peek window in the canopy – but it is removable. It may be hard to push the stroller on uneven terrain. The stroller is more costly than some other travel models. Overall, the UPPAbaby G-LUXE Stroller would make a great travel stroller. Are you in need of a stroller that comes in a storage bag for travel? Then take a look at the Jovial Portable folding Baby Stroller. This portable stroller weighs sixteen pounds. This folding stroller is perfect for storing in a trunk or checking in to the airplane when traveling. This portable stroller comes with its own storage bag for ease of traveling. It’s made even easier for travel with its one hand quick foldability. The Jovial has an enhanced braking system that allows you to stop easily. This stroller has a parking brake that is activated by foot. The seat is fully adjustable to multiple positions for sitting or lying flat in a bassinet style position. The retractable canopy keeps your child out of the elements and allows you to adjust how much sun they receive. Some of the other features include a storage area under the stroller and a five-point harness for safety. This portable stroller will accommodate a newborn to a three-year-old child. This stroller has a parking brake that is activated by foot. The retractable canopy keeps your child out of the elements and allows you to adjust how much sun they receive. The stroller is hard to open and close. The seat does not adjust smoothly or properly. The stroller does not stand by itself when folded. Moderately priced for the lack of features that you receive with the stroller. The size of the wheels means that they only work on flat surfaces. The Jovial Portable folding Baby Stroller leaves something to be desired. It does have a few good points. This stroller has a parking brake that is activated by foot. The seat is fully adjustable to multiple positions for sitting or lying flat in a bassinet style position. The retractable canopy keeps your child out of the elements and allows you to adjust how much sun they receive. However, it has more negatives than positives. The stroller is hard to open and close. The seat does not adjust smoothly or properly. The stroller does not stand by itself when folded. Moderately priced for the lack of features that you receive with the stroller. The size of the wheels means that they only work on flat surfaces. You need to look carefully at this stroller before you decide to make a purchase. If you are looking for a comfortable ride in a travel stroller for your little one, then you need to take a look at the Zoe XL1 Beat v2 Lightweight Travel & Everyday Umbrella Stroller. This stroller weighs a little over eleven pounds. One of the best things about the Zoe is the large canopy. It has a large zippered panel in the back with a mesh window for you to peek in at your little one. 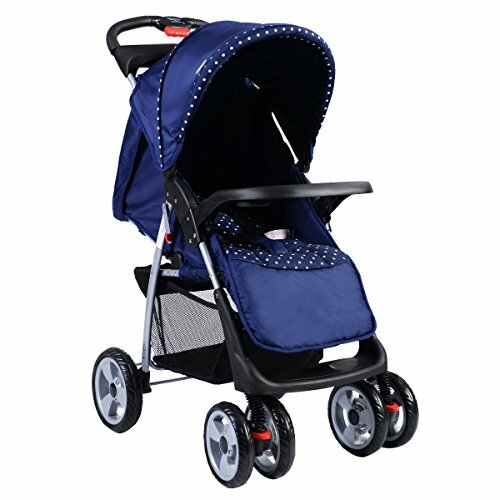 There is a zip-open panel that makes the canopy even larger to almost enclose the entire stroller. Some of the features on this travel stroller are the back storage pocket, the under storage area, a passenger snack holder, and a cup holder. The Zoe has multiple position reclining seat that makes sleeping and changing a breeze. This travel stroller comes in two colors to choose from. The Zoe has a large canopy with a mesh window to peek at your little one. This travel stroller has a back storage pocket, under a storage area, a passenger snack holder, and a cup holder. This lightweight travel stroller weighs only a little over eleven pounds. This stroller does not handle well off paved surfaces. This stroller is more costly than some other travel model strollers. The Zoe XL1 Beat v2 Lightweight Travel & Everyday Umbrella Stroller is a good travel stroller. The Zoe has a large canopy with a mesh window to peek at your little one. This travel stroller has a back storage pocket, under a storage area, a passenger snack holder, and a cup holder. This lightweight travel stroller weighs only a little over eleven pounds. The Zoe has multiple position reclining seat that makes sleeping and changing a breeze. This travel stroller comes in two colors to choose from. The Zoe does have a few drawbacks. This stroller does not handle well off paved surfaces. This stroller is more costly than some other travel model strollers. For a travel stroller, you couldn’t go wrong with the Zoe XL1 Beat v2 Lightweight Travel & Everyday Umbrella Stroller. If you want a travel stroller that will fit in the overhead on an airplane, then look no further than the BabyZen Yoyo+ Stroller. This lightweight travel stroller weighs thirteen pounds. This travel stroller will accommodate children from birth to forty pounds. The BabyZen travel stroller even has storage. 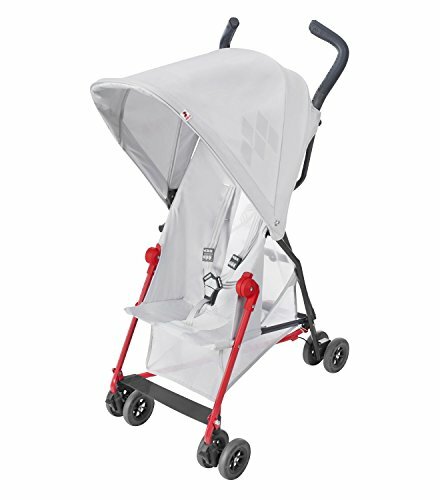 There is a storage area under the stroller as well as a storage pouch at the back of the canopy. To help protect your child from the elements, the BabyZen has an extendable canopy. The canopy also works with the multiple positions reclining-seat. Worried that you will get caught in the rain? Well, this stroller comes with a rain cover just in case. This small folding travel stroller has a carrying strap. For the comfort and safety of your child, there are features such as leg rests that are extendable, a five-point safety harness, and fabrics that are removable so they can be washed. This travel stroller can be strolled over some terrain that is rougher all without locking the wheels. This stroller comes in six colors. To help protect your child from the elements, the BabyZen has an extendable canopy. There are features such as leg rests that are extendable, a five-point safety harness, and fabrics that are removable so they can be washed. This stroller comes in six colors. This stroller is very expensive. This stroller is not easy to use with one hand. The BabyZen does not have a footrest so your baby can slide down. The wheels are not very sturdy so you feel every bump you go over. The BabyZen Yoyo+ Stroller was a disappointment for the money. It does have some good points. To help protect your child from the elements, the BabyZen has an extendable canopy. There are features such as leg rests that are extendable, a five-point safety harness, and fabrics that are removable so they can be washed. This stroller comes in six colors. Unfortunately, there are too many negatives to deal with at this price point. This stroller is very expensive. This stroller is not easy to use with one hand. The BabyZen does not have a footrest so your baby can slide down. The wheels are not very sturdy so you feel every bump you go over. Overall, this stroller has too many issues for the price you have to pay for it. You are better off finding a mid-price travel stroller with the features that matter the most to you. Are you looking for a more active travel stroller? 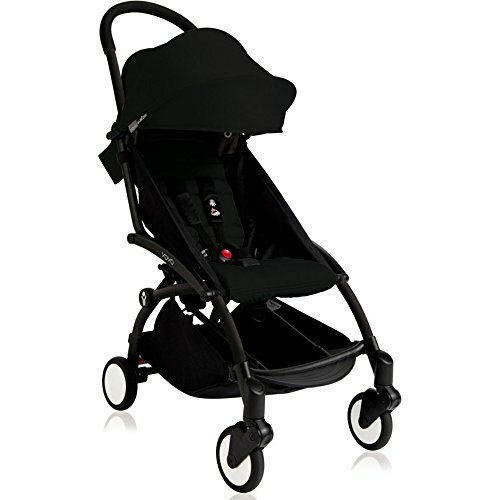 Then you may want to consider the Baby Jogger City Mini 3W Single Stroller. This travel jogger only weighs in at a little more than seventeen pounds. This compact stroller folds in one easy step. The seat on this jogger has multiple reclining positions. This stroller will accommodate a child up to fifty pounds. 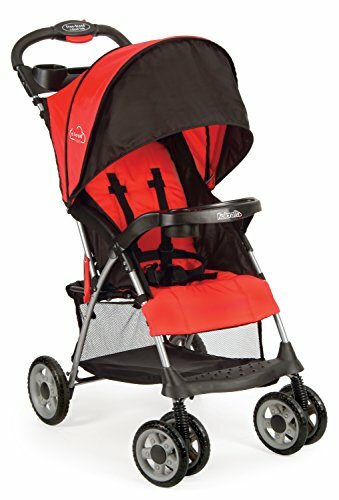 There is a canopy on this Baby Jogger stroller that has 50+ protection that you can adjust according to the height of the baby’s height. The canopy has two windows that you can peak in to look in at your little one. This three-wheeled stroller has eight-inch tires with front wheels that lock and suspension in the front wheel. This travel stroller even has a car seat adaptor. 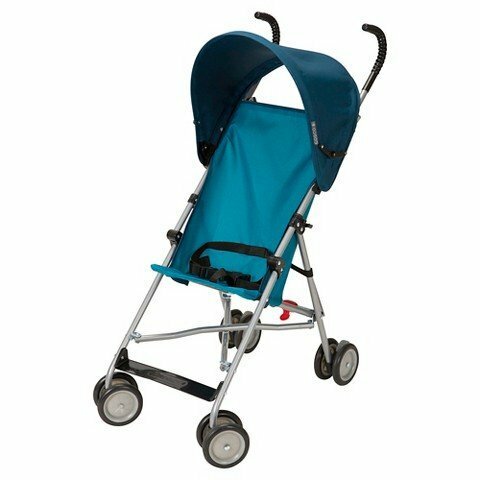 This stroller is available in eight colors. This travel stroller is lightweight for a jogger. This jogger is easy to turn and push. The canopy has two windows to peak in at your little one. This stroller comes in eight colors. This travel stroller costs a little more than some other travel models. The storage space is limited and hooks on the handles throw the balance of the stroller off. The back tires protrude so it is not easy to maneuver in a crowd. The Baby Jogger City Mini 3W Single Stroller has both good and bad points. On the good side, this travel stroller is lightweight for a jogger. This jogger is easy to turn and push. This compact stroller folds in one easy step. The canopy has two windows to peak in at your little one. This stroller comes in eight colors. However, this travel stroller costs a little more than some other travel models. The storage space is limited and hooks on the handles throw the balance of the stroller off. The back tires protrude so it is not easy to maneuver in a crowd. Overall, not a bad choice for a travel stroller if you can live with the cons. If you are looking for a simple and inexpensive travel stroller, then you may be looking for the Cosco Umbrella Stroller with Canopy. This lightweight travel stroller weighs a little more than eight pounds. 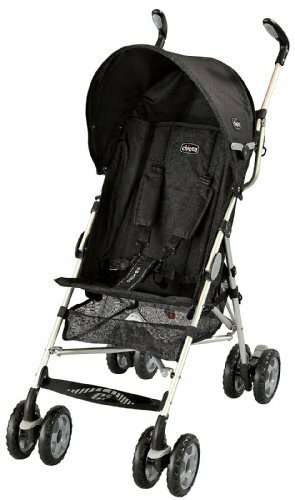 This no-frills stroller has an adjustable canopy that offers a small amount of protection from the elements as well as from the sun’s rays. The stroller is lightweight and folds easily, so you can carry it and store it for travel without any issues. It folds in an umbrella fold. The Cosco has a three-point harness and will accommodate a child up to forty pounds. This stroller is JPMA Certified. This stroller comes in three colors. This stroller is very affordable. This lightweight travel stroller is only a little over eight pounds. The stroller has a small canopy. The stroller has a three-point harness instead of the safer five-point safety harness. There are no storage compartments on this stroller. This stroller does not recline at all. The Cosco Umbrella Stroller with Canopy is just your basic umbrella stroller with no frills. It does have a couple of good points. This stroller is very affordable. This lightweight travel stroller is only a little over eight pounds. The stroller has a small canopy. This stroller is JPMA Certified. This stroller comes in three colors. However, this stroller has none of the features that you look for in a stroller. The stroller has a three-point harness instead of the safer five-point safety harness. There are no storage compartments on this stroller. This stroller does not recline at all. If you are just looking for a travel stroller for a quick trip that you use a time or two, then this may be what you are looking for. But if you are looking for a travel stroller that you can use time and time again, I suggest that you look for something that has more features that will offer your child more comfort, and will stand up to the test of time. If you are looking for a lightweight travel stroller, then you may want to consider the Maclaren Mark II Stroller. This travel stroller weighs a little over seven pounds. This stroller can accommodate children from six months to fifty-five pounds. This stroller has a seat that reclines that has a mesh panel in the center that is breathable for the child’s comfort. The canopy is UPF 50+. 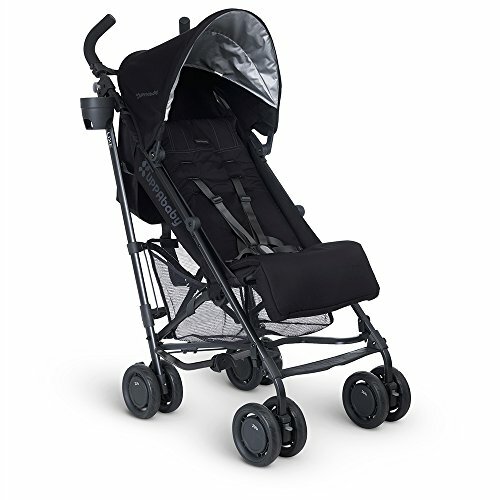 For added comfort, this stroller has a rain cover that is wind resistant and an ID tag for the buggy. 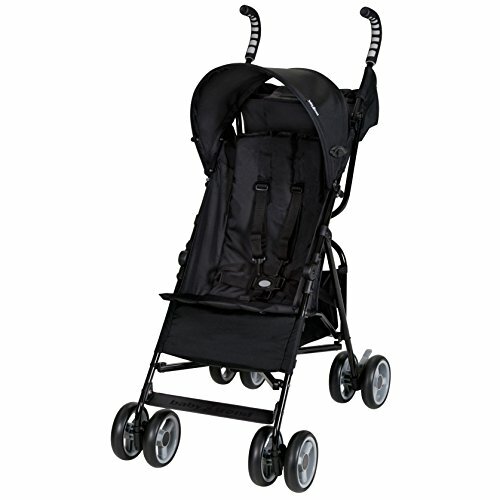 The handles of the stroller are antimicrobial and the brake system is cable linked. The suspension is four wheel for great maneuverability. Some other conveniences are the storage area, the carrying strap for ease of toting, and the umbrella fold. The seat pad is removable so you can machine wash it. Best of all, the stroller comes fully assembled – no assembly is required. It comes ready to use. This stroller comes in four colors. This lightweight travel stroller weighs a little over seven pounds. This stroller has a storage area, a carrying strap for ease of toting, and it folds with an umbrella fold. This stroller has a seat that reclines that has a mesh panel in the center that is breathable for the child’s comfort. This stroller is hard to maneuver. The safety harness straps are long and it is hard to buckle. The storage area is in a funny area and not large. The Maclaren is not easy to fold and unfold. This stroller is higher priced for a travel stroller with few features. The Maclaren Mark II Stroller has more negatives than positives. But let’s focus on the positives first. This lightweight travel stroller weighs a little over seven pounds. This stroller has a storage area, a carrying strap for ease of toting, and it folds with an umbrella fold. This stroller has a seat that reclines that has a mesh panel in the center that is breathable for the child’s comfort. This stroller comes in four colors. Let’s take a look at the negatives. This stroller is hard to maneuver. The safety harness straps are long and it is hard to buckle. The storage area is in a funny area and not large. The Maclaren is not easy to fold and unfold. This stroller is higher priced for a travel stroller with few features. The price would not be that much of a concern if this stroller was easier to maneuver and had the features that you were looking for in a travel stroller. Keep these things in mind as you look for the travel stroller that is right for you and your child. 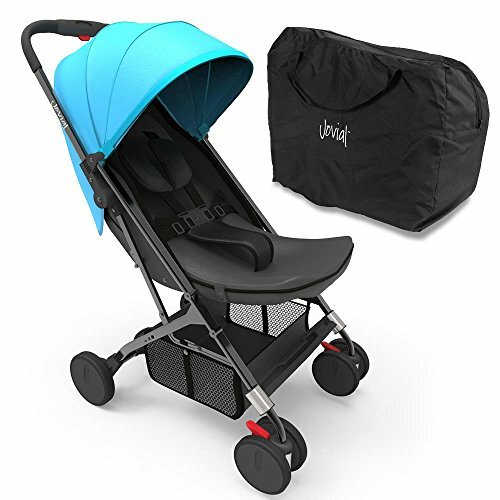 If you are looking for an inexpensive travel stroller that is a little sturdier than an umbrella stroller, then take a look at the Costzon Foldable Baby Kids Travel Stroller. This travel stroller weighs a little more at almost seventeen pounds. The stroller can accommodate a child up to thirty-three pounds. Some of the features that this stroller has is a five-point safety harness, a removable front tray, an adjustable canopy with a window you can peek at your little one, and a reclining seat. In addition, the travel stroller has 360-degree rotating front wheels as well as 360-degree brakes. 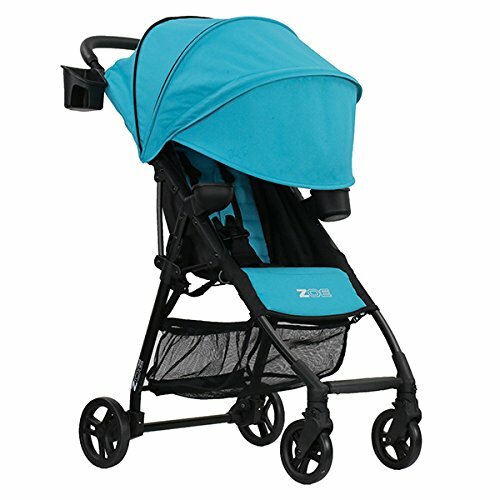 The Costzon has a storage area under the stroller and it is easy to open and close. This affordable travel stroller comes in three colors. This stroller has is a five-point safety harness, a removable front tray, an adjustable canopy with a window you can peek at your little one, and a reclining seat. The travel stroller has 360-degree rotating front wheels as well as 360-degree brakes. The wheels are made from cheap materials so they do not stand up very well to time or handle on anything other than flat surfaces. The flimsy frame can only handle smaller infants. As they become toddlers, it becomes more difficult to steer. This stroller is very hard to open and close. The Costzon Foldable Baby Kids Travel Stroller has some pros and cons. This stroller has is a five-point safety harness, a removable front tray, an adjustable canopy with a window you can peek at your little one, and a reclining seat. The travel stroller has 360-degree rotating front wheels as well as 360-degree brakes. This affordable travel stroller comes in three colors. Unfortunately, there are many issues. The wheels are made from cheap materials so they do not stand up very well to time or handle on anything other than flat surfaces. The flimsy frame can only handle smaller infants. As they become toddlers, it becomes more difficult to steer. This stroller is very hard to open and close. I suggest saving a little more money and investing in a safer travel stroller that you can use for a longer period of time that has more of the features that you may be looking for. Also look for a stroller that is easier to open and close as well as maneuver. If you are a Graco fan and want to use your car seat with a stroller, then you may want to try the Graco Snugrider Elite Stroller and Car Seat Carrier. This carrier weighs a little more than fifteen pounds. With this carrier, you turn your car seat into a stroller. This model is for Graco brand car seats only. This is very portable for travel because you have to take your car seat anyway so taking a lightweight frame that the car seat attaches to is super simple. This stroller allows you to open and close it with one hand in a standing fold so you never have to bend over and it locks automatically. The stroller has a large storage area with a pocket that is zippered for security. It also doesn’t matter how tall you are as you adjust the handle to the height you desire. Maneuvering is easy with swivel front wheels. There is also a parent tray that has two cup holders. This frame is easy to fold. There is a large storage area that is zippered. You can adjust the height of the handles. This frame only works with Graco car seats. Your little one will outgrow this stroller when they outgrow their car seat. Maneuverability can be difficult with the car seat on it. If you are looking to travel with a car seat then the Graco Snugrider Elite Stroller and Car Seat Carrier may be something to consider. This frame is easy to fold. This frame is affordable. There is a large storage area that is zippered. You can adjust the height of the handles. However, this frame only works with Graco car seats. Your little one will outgrow this stroller when they outgrow their car seat. Maneuverability can be difficult with the car seat on it. If you are looking for a travel stroller with some longevity, then this is not the way to go. However, if you are only looking for a travel stroller for a limited time, you may want to consider a car seat frame stroller. If lightweight and cost mean the most when looking for a travel stroller, then take a look at the Kolcraft Cloud plus Lightweight Stroller. This stroller weighs a little over eleven pounds. The Kolcraft has a three-tiered canopy that extends for protection from the sun’s rays. The canopy has a peek window so you can take a look at your little one anytime you want. This stroller has a standing fold that you can achieve with only one hand. That makes it easy to fold and unfold when on the go. The seat reclines in multiple positions, has a five-point harness, and will seat a child up to fifty pounds. There is a large storage area under the seat, a child tray that is removable that will accommodate a juice box and a cup, and a parent tray that will accommodate two drink and storage. This travel stroller has a warranty from the manufacturer for one year and is JPMA Certified. This stroller has a standing fold that you can achieve with only one hand. The stroller will not stay folded – it unfolds by itself. Safety harness does not adjust enough for most children. You have to remove the snack tray to get your child in and out. Seat does not position well. I was not impressed with the Kolcraft Cloud plus Lightweight Stroller. It did have a few things going for it. The seat reclines in multiple positions, has a five-point harness, and will seat a child up to fifty pounds. This affordable stroller comes in two colors. This travel stroller has a warranty from the manufacturer for one year and is JPMA Certified. This stroller has a standing fold that you can achieve with only one hand. However, the negatives outweigh the positives. This stroller is hard to maneuver. The stroller will not stay folded – it unfolds by itself. The safety harness does not adjust enough for most children. You have to remove the snack tray to get your child in and out. The seat does not position well. Overall, I would not recommend this stroller at all. I would look at a stroller that was sturdier and maneuvered better and had features that you thought would suit your needs. Making the decision on a travel stroller can seem like an overwhelming task. Once you have looked at whether you want a convenience stroller, an umbrella stroller, or a car seat frame stroller, you need to look at features. Some of the features I looked at were ease of portability, ease of maneuvering, storage, the reclining seat, the safety harness, and the canopy. I looked for things like cup holders and if it was lightweight or not. After considering all these options, the Zoe XL1 Beat v2 Lightweight Travel & Everyday Umbrella Stroller came out on top. The Zoe has multiple positions reclining seat that makes sleeping and changing a breeze. The Zoe XL1 Beat v2 Lightweight Travel & Everyday Umbrella Stroller has all the features that you could possibly want in a travel stroller.